Musical training doesn't just improve your ear for music — it also helps your ear for speech. That's the takeaway from an unusual new study published in The Journal of Neuroscience. 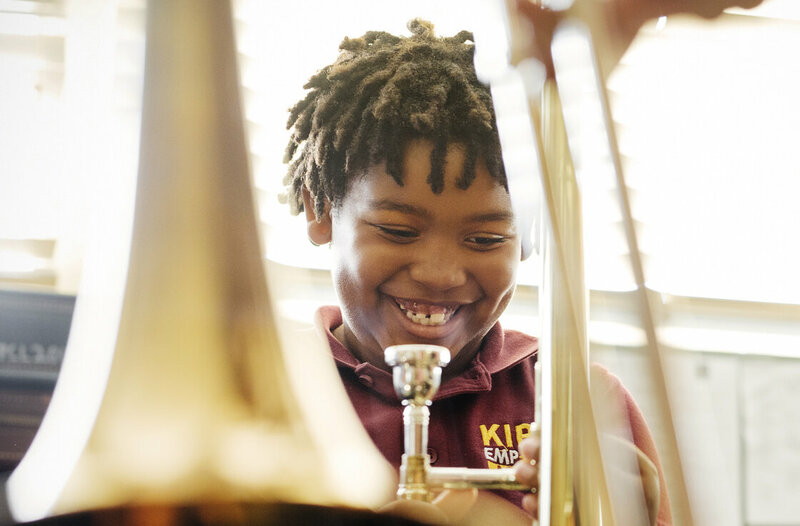 Researchers found that kids who took music lessons for two years didn't just get better at playing the trombone or violin; they found that playing music also helped kids' brains process language. And here's something else unusual about the study: where it took place. It wasn't a laboratory, but in the offices of Harmony Project in Los Angeles. It's a nonprofit after-school program that teaches music to children in low-income communities. Two nights a week, neuroscience and musical learning meet at Harmony's Hollywood headquarters, where some two-dozen children gather to learn how to play flutes, oboes, trombones and trumpets. The program also includes on-site instruction at many public schools across Los Angeles County. "Since 2008, 93 percent of our high school seniors have graduated in four years and have gone on to colleges like Dartmouth, Tulane, NYU," Martin says, "despite dropout rates of 50 percent or more in the neighborhoods where they live and where we intentionally site our programs." There are plenty of possible explanations for that success. Some of the kids and parents the program attracts are clearly driven. Then there's access to instruments the kids couldn't otherwise afford, and the lessons, of course. Perhaps more importantly, Harmony Project gives kids a place to go after the bell rings, and access to adults who will challenge and nurture them. Keep in mind, many of these students come from families or neighborhoods that have been ravaged by substance abuse or violence — or both. Enter neurobiologist Nina Kraus, who runs the Auditory Neuroscience Laboratory at Northwestern University. When a mutual acquaintance at the National Institutes of Health introduced her to Martin, Kraus jumped at the chance to explore Martin's hunch and to study the Harmony Project kids and their brains. Using some relatively new, expensive and complicated technology, Kraus can also break these brainwaves down into their component parts — to better understand how kids process not only music but speech, too. That's because the two aren't that different. They have three common denominators — pitch, timing and timbre — and the brain uses the same circuitry to make sense of them all. And that's a problem, Kraus says, because "in the absence of stimulation, the nervous system ... hungry for stimulation ... will make things up. So, in the absence of sound, what we saw is that there was just more random background activity, which you might think of as static." Learning to play an instrument appears to strengthen the brain's ability to capture the depth and richness of speech sounds. These heat maps of brainwaves show how much music lessons improved kids' neurophysiological distinction of consonants. Working with Harmony Project, Kraus randomly assigned several dozen kids from the program's waitlist into two groups: those who would be studied after one year of music lessons and those who would be studied after two years. And what she found was that in the two-year kids, the static didn't go away. But their brains got better — more precise — at processing sound. In short: less blur. It goes back to pitch, timing and timbre. Kraus argues that learning music improves the brain's ability to process all three, which helps kids pick up language, too. Consonants and vowels become clearer, and the brain can make sense of them more quickly. That's also likely to make life easier at school, not just in music class but in math class, too — and everywhere else. To be clear, the study has its limits. It was small — roughly 50 kids, ranging in age from 6 to 9. It wasn't conducted in a lab. And it's hard to know if kids doing some other activity could have experienced similar benefits. But 10th-grader Monica Miranda doesn't need proof that playing violin has helped her. She's one of the first students in the door at a recent Harmony Project re-enrollment event in the auditorium of a nearby elementary school. "I feel like music really connects with education," she says. "It helps you concentrate more." "When I do my homework or I'm studying for something and I feel overwhelmed, I usually go to my violin, to start playing it," Miranda says. "I feel like it relaxes my mind. And coming here to play with an orchestra, it's just amazing. I love it." You don’t find school reformers talking much about how we need to train more teachers in the arts, given the current obsession with science, math, technology and engineering (STEM), but here’s a list of skills that young people learn from studying the arts. They serve as a reminder that the arts — while important to study for their intrinsic value — also promote skills seen as important in academic and life success. (That’s why some people talk about changing the current national emphasis on STEM to STEAM.) This was written by Lisa Phillips is an author, blog journalist, arts and leadership educator, speaker and business owner. To learn about Lisa’s book, “The Artistic Edge: 7 Skills Children Need to Succeed in an Increasingly Right Brain World,” . This appeared on the ARTSblog, a program of Americans for the Arts.